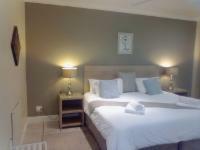 Redbourne Country Lodge is an intimate, well-priced lodge offering bed and breakfast accommodation in Plettenberg Bay. Set in the tranquil Piesang Valley, overlooking the Plettenberg Bay Country Club golf course Redbourne is sure to become any discerning traveler's favourite destination. 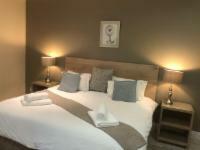 Redbourne Country Lodge boasts 16 luxury en-suite rooms, including four inter-leading family rooms. Each room offers the guests, DSTV, ceiling fans, mini bar with tea and coffee facilities, hairdryers, a personal safe, laundry services, underfloor heating and private decks with beautiful valley views. An inviting swimming pool overlooks the golf course. Internet and Wi-Fi connectivity is available in the main lodge. With comfortable upmarket, but affordable accommodation, combined with an extraordinary level of personal service, Redbourne will give you the rest and relaxation you deserve. Redbourne is a short distance from the village of Plettenberg Bay and its breath-taking beaches on the most sought-after Garden Route of South Africa. Family friendly: Our lovely interleading rooms offer both a King size bed and two twin beds making it a perfect family getaway destination. Cots for infants are also available. These rooms and cots are subject to availability. Romantic: Situated in the tranquil Piesang Valley, Redbourne is sure to become a romantic traveler's favorite destination. Whether it is your honeymoon or your anniversary, we will go to extra lengths to make it a special occasion for you and you loved one. 2. Children are welcome at Redbourne Country Lodge, subject to availability of child-friendly rooms and equipment. 3. Infants 0-3 years stay free when sharing with adults. 4. Children 4-12 years - a child rate applies when sharing with two adults. 5. Children 12-18 years - a... 1. All rates are in South African Rands and include VAT. 5. Children 12-18 years - a child rate applies when sharing with two adults. 7. Please note that all guests will be required to sign an indemnity form on arrival. Redbourne Country Lodge- Lion Roars Hotels & Lodges is 1.8km from the centre of Piesang Valley , the nearest airport 108.2km (George Airport).